The Ariane 5 rocket lifted off in a ball of fire at sunset Wednesday. 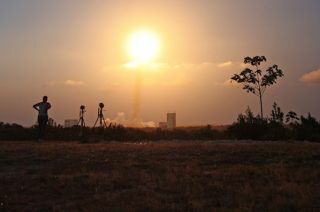 KOUROU, French Guiana — Generating an exhilarating wave of sound and light spreading miles around, an Ariane 5 rocket rose into space at sunset Wednesday with a communications satellite for the Middle East and another craft to serve commercial and U.S. government customers over North America. Grounded for a day by a labor dispute at the launch base, the Ariane 5 rocket ignited its clean-burning hydrogen-fueled Vulcain 2 main engine at 2138 GMT (5:38 p.m. EDT), waited seven seconds for a computer-run health check, then fired two cylindrical solid rocket boosters and climbed away from the Guiana Space Center. The sprawling 270-square-mile spaceport is in French Guiana, an overseas department of France on the northeast coast of South America. It is home to Europe's Ariane rocket family, which will soon be joined by Russian Soyuz launchers and the Italian-led Vega light rocket project. The Ariane 5 launcher quickly cleared four lightning towers at the pad, pitched east away from the space center and accelerated past the speed of sound in 48 seconds. After punching through a thin layer of high clouds, the rocket jettisoned the spent solid rocket booster casings and continued its flight into orbit with cryogenic engines. The 16-story rocket successfully released both payloads at the correct point in space, reaching an orbit ranging from 155 miles to 22,300 miles high with an inclination of 1.99 degrees, according to Arianespace, the commercial operator of the Ariane 5 vehicle. "This 60th launch of Ariane 5 just placed into geostationary transfer orbit Arabsat 5C and SES 2," said Jean-Yves Le Gall, chairman and CEO of Arianespace. Referring to mishaps of the Proton and Long March launch systems in August, Le Gall said: "This summer, our competitors had some problems and this shows that, once again, our launcher is the most reliable in the world by far." Wednesday's launch marked the 46th consecutive success for the Ariane 5 rocket dating back to a failure in 2002. Arabsat 5C, a communications satellite for broadcasting and Internet services, was deployed first at the mission's 27-minute point. After a careful sequence of avoidance maneuvers, the Ariane 5's cryogenic upper stage dispatched the SES 2 payload nearly 36 minutes after liftoff. Both satellites will go through a series of orbit-raising burns in the coming days. The spacecraft will also unfurl their solar panels and reflectors before in-orbit testing. Arabsat 5C is destined for an orbital slot 22,300 miles over the equator at 20 degrees east longitude. The satellite's mission is to provide broadcasting, telephony, professional communications, Internet routing, VSAT and interactive services across the Middle East and Africa. Astrium of France built the 10,183-pound spacecraft, while Thales Alenia Space developed Arabsat 5C's payload, which includes four deployable antenna reflectors, 26 active C-band transponders and wide-band transponders over 10 locations in Ka-band. Manufactured by Orbital Sciences Corp., the SES 2 satellite is heading for an operational position at 87 degrees west longitude, where its 48 C-band and Ku-band transponders will reach customers across North America. Ordered by SES to replenish its fleet of satellites covering North America, SES 2 is one of three virtually identical satellites built by Orbital for SES and launched in 2010 and 2011. The Air Force plans to activate the CHIRP experiment about 30 days after launch, then begin an experimentation phase. It features a wide field-of-view staring sensor to pick up infrared signatures of missile plumes, explosions and fires. Science Applications International Corp. of Virginia designed and built CHIRP. Orbital Sciences integrated the instrument on the SES 2 spacecraft. "At the end of the day, the SES 2 spacecraft is not really about CHIRP," said Tip Osterthaler, president and CEO of SES government services. "It's about all of our commercial customers over North America, our oil and gas customers, Clear Channel Communications customers and other media customers as well."